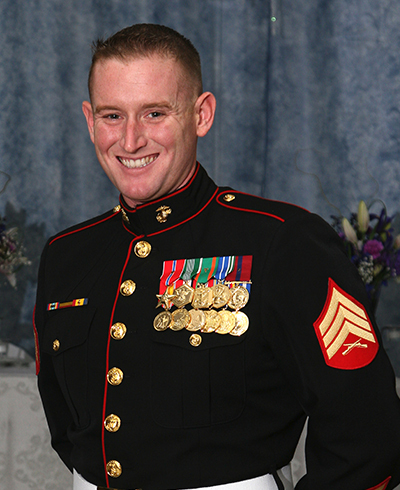 Born in Flint, MI and a 2001 graduate of Davison High School, Staff Sergeant Nicholas Sprovtsoff enlisted in the Marine Corps in 2001. He began his career as an Amphibious Assault Vehicle Crewman at Camp Pendleton, CA but later made a lateral move and attended the Explosive Ordinance Disposal School in 2009. He joined MARSOC in November 2009, and graduated from the Basic Reconnaissance Course and Advanced Improvised Explosive Disposal Course in 2010. SSgt. Sprovtsoff was a Green Belt Marine Corps Martial Arts Program instructor. On his last deployment with Alpha Company, 1st MSOB, based out of Camp Pendleton, while supporting Operation Enduring Freedom, SSgt. Sprovtsoff was killed during an IED blast while on combat patrol in Mirmandab. He attempted several times to defuse the IED, and his actions in identifying the IED and clearing the area saved the lives of countless others. SSgt. Sprovtsoff’s personal decorations include a Silver Star awarded posthumously in 2016, a Bronze Star with combat V, Purple Heart, Army Commendation Medal, Navy-Marine Corps Achievement Medal with combat V, Army Achievement Medal, two Combat Action Ribbons and three Good Conduct Medals.